Sings weekly during the 8:30 and 11:00 worship services. Enjoy compositions that represent music of all historical periods, from blues and jazz to Mozart and Handel, and everything in between. Rehearsals on Wednesdays at 7:00 p.m. in the Sanctuary. All adults and youth are welcome. 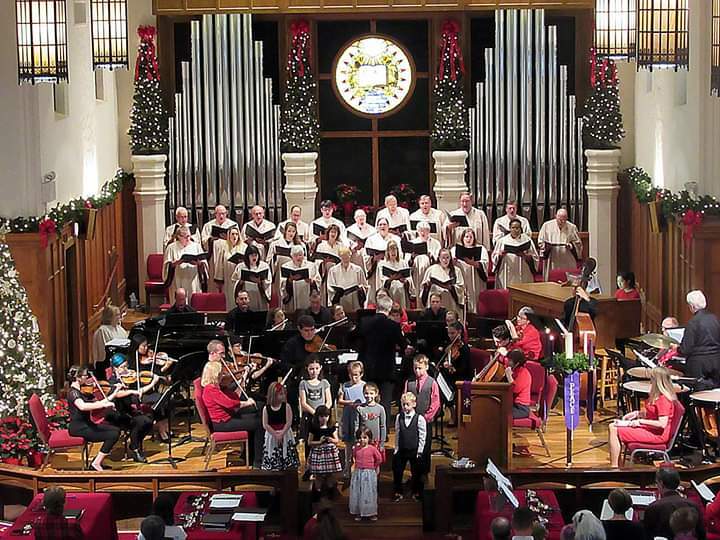 Plays a wide variety of music including hymns, arrangements, and original compositions. Also provides colorful accompaniment to anthems sung by the Chancel Choir. Rehearsals on Wednesday evenings at 6:00 p.m. in the Sanctuary. All with playing experience are welcome. An adult five-octave bell choir that rings challenging music once a month in the 11:00 a.m. worship service. Ringers attend the Florida State Handbell Festival in the Spring and also participate in the annual Lessons and Carols service as well as Easter Sunday. Rehearsals on Thursday evenings from 6:30 - 7:30 p.m.
An adult bell choir of 5-6 ringers playing 2 octaves of bells. For the more advanced ringer, this group rings for special occasions and other worship services. Soloists and ensembles are always welcome to sign up and share their gifts during the Monday afternoon worship service from 3:30-4:30 p.m. in Fellowship Hall. Music is organized by Marlene Udell. Children's Choir rehearses during the Sunday school hour from September to May and sing in worship once a month. Children learn to sing, ring, and play instruments. All children are welcome. Come and experience the magic of Harry Potter as you work your way through activities and fun! Wands, Potions, DIvination, Leaky Cauldron, Hogwarts Express, Quidditch, and more. Be sorted into your Hogwarts House for the battle over the House Cup. May 4 at 1 p.m.; May 5 at 4 p.m. In the works! A new ministry of First UMC which will provide space to private lessons ranging from piano and voice to organ and dance. Registration will begin August 2019. One Sunday in each month, from June through August, small groups are organized to sing, ring, or play in the worship services. Questions? Contact Michael Ekbladh, Director of Music Ministries, at michael@fumcgnv.org or 352-372-8523 ext. 20. Organ rebuilt by Berghaus - installed Sept-Nov 2007 from M.P Moller, Inc organ Opus 7055 built in 1941 and rebuilt in 1979. For a full list of stops contact Michael Ekbladh.